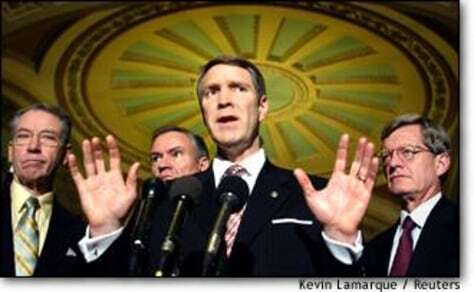 Senate Majority Leader Bill Frist, center, speaks to reporters at the Capitol on Monday. Joining Frist from left are Sens. Chuck Grassley, R-Iowa, John Breaux, D-La.. and and Max Baucus, D-Mont.